Club Penguin Cheats by Mimo777 Club Penguin Cheats by Mimo777: Club Penguin Pufflescape Construction! IT TAKES UP TOO MUCH ROOM! Wow! The new friends experience thing is here! When someone asks to be your friend a pop-up similar to when your puffle needs you comes up! And when you get an accepted friend request it pops up. And when your friend is online it pops up AND says where they are. When you want to have a look at your friends it shows all the player cards in mini size!! Plus you can now find players! 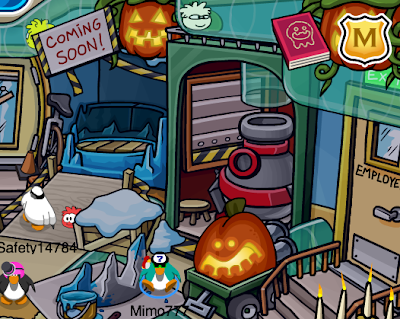 You don't have to meet someone at the same time on CP to be their friend! When you search their name it shows a mini player card pic! Lolz you can add Rockhopper (plus other CP characters) as a friend... or so it says "Rockhopper be sailin' the high seas! To add him as a friend, you must meet him on the island." And Jet Pack Guy + Rookie + Dot are cp characters which you can 'meet'. They have the same ‘to add him/her as a friend’ message as Rockhopper! Lolz, check out Klutzy's and Herbert P Bear's (make sure to type in ‘Herbert P Bear’) descriptions! I can search you as a friend!!! The settings button has been updated and the 'ignore' penguins are now in the settings! Just open the settings, click on the skull on the bottom and voila, the ignore people in an old-type list. Type "pumpkin1" into code unlock to get a free all user surprise, this code can be found on Disney Channel. I sure hope the Fluffy the fish game is coming soon too.